Demo models of the recently introduced Microsoft Surface Pro 3 are now available in the Windows Store at Best Buy. This allows you to get a personal, hands-on look at the the 12 inch slate. The device was introduced on May 20th and is expected to be released on June 20th. Along with a demo of the tablet, you can also check out the new Type Cover that is being offered for the slab. 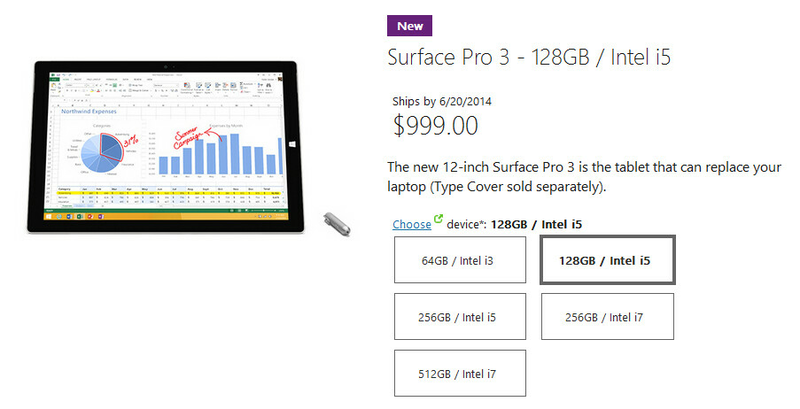 After checking out the demo model, you can pre-order the Microsoft Surface Pro 3 online from the Microsoft Store. The basic model features a Core i3 processor, 4GB of RAM, 64GB of native storage, and is priced at $799. For $1299 you can reserve a model with the Core i5 processor, 8GB of RAM and 128GB of native storage. Two models can be pre-ordered with the Core i7 chip and 8GB of RAM. One tablet sports 256GB of storage ($1549) while the other model includes 512GB of memory ($1949). Before you make an investment in your new tablet, you should check out the Microsoft Surface Pro 3 demo at Best Buy. 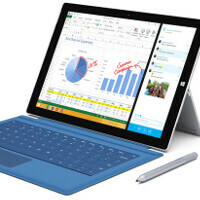 The tablet is equipped with a pair of 5MP cameras and the Surface Pen for taking notes and for drawing. The battery should provide you with 9 hours of web browsing on a single charge. Most elegant tablet ever made.... So beautiful. This is a real tablet with a real multitasking capabilities . However the price here are the deal breaker hopefully they dropped down the price for i7 . It's what you called future proofing. It's my preference over i5 besides I'm already using an i5 vaio. Beer at a stadium is a rip off because everyone wants beer at a stadium and there is no where else to get it. The i7 is not a rip off because there are plenty of cheaper alternatives and if someone doesn't mind spending the money for one then that is their prerogative. Great reply! I might have to use this response in the future. :) But it's so true! If they put lower price, then this will harm their OEM partners. You know what is a rip off..... A Samsung Galaxy Tab Pro 12 inch tablet. The general/average consumer won't be attracted to these prices. I'm buying because it's damn more useful than mere tablets like iPads. A 64GB iPad Air is $700. That's a $99 difference compared to the 64GB version of the Surface Pro 3. A SP3 can do way so much more worth FULL programs running from over 4 million, and you can expand that with a micro SD card. A 64 GB one seems practical enough, or get a still rare 128 GB card. iPads don't have memory expansions. You don't seem like the average regular consumer….Looks like I offended someone, again. Also looks like someone had to bring Apple into this lmao. Tsk tsk. More obsessed with Apple than Apple themselves. Microsoft is already selling Surface units at a loss from an article I've read. I remember spending slightly lower than $750 on an Intel Atom based netbook 6 years back. It had 80GB HDD, 2GB RAM, a 10" 600 by 1024 pixel screen. A 13" Mac Air at $999 for a 128GB version, and the 11" version starts at $899. What I'm getting at is the above high ended device Ultra book pricing range compared to the SP3 seems at par. No, these are not your regular affordable (now) netbooks or more expensive tablets that do less. $799 or $999 for a 128GB full Windows slate with a nifty kickstand and active digitizer sounds good to me. In my opinion Windows 8 is a masterful OS besides Windows 7 is in Windows 8 desktop mode. People rag on Metro UI yet everybody is copying it, makes no sense. There no real advantage to Windows 8 over Windows 7. Looking forward to Windows 9 design hopefully will be better. A more beautiful, faster, more productive homescreen etc are not advantages?. The Apple and iOS fanboys always #itch about Windows. Lol, I just came home from Best Buy. Saw some Indian guys trying out the Surface Pro 3.